Image caption Auctioneer Jonathan Humbert said he believed the picture to be of "national importance"
A painting thought to be a previously unknown portrait of the three Bronte sisters is expected to make up to £40,000 at auction. The watercolour, attributed to Queen Victoria's favourite artist Sir Edwin Landseer, is being sold by JP Humbert, of Whittlebury, Northamptonshire. Auctioneer Jonathan Humbert decided to pull the picture from an auction in 2012 so more research could be done. Mr Humbert said he believed the picture to be of "national importance". 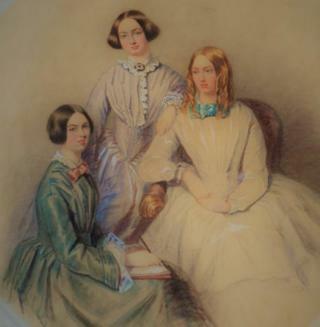 If the painting is of the Brontes it will be only the second known group portrait of the literary sisters in existence - the other is in the National Portrait Gallery. Mr Humbert said: "Interesting new evidence has now come to light that a black bracelet featured in the painting worn by Anne Bronte is known to now be in the Bronte Parsonage Museum Collection. "This link to a known museum artefact supports the other well-documented facts that this painting is a bridge between the literary and art worlds and is indeed a painting of national importance." He said the Brontes and Landseer are known to have met when he visited the area in the 1830s. Leading Landseer authority Richard Ormond OBE has concluded it "undoubtedly related" to a pastel drawing thought to be of the Brontes made two years earlier by Landseer, an image of which is held on file at the National Portrait Gallery. Mr Humbert said the portrait was acquired by mistake when the current owner purchased a painting from an auction house in the South West which could not be found and the Bronte painting was produced in lieu. The portrait is being offered "without reserve" in a timed online-only auction which finishes on Sunday. Already £9,850 has been bid for the work. Landseer was a popular Victorian painter best known for his animal portraits and designing the bronze lions in Trafalgar Square in London. The Bronte family moved to Haworth, West Yorkshire, in 1820 where the Reverend Patrick Bronte was appointed Curate of Haworth. They lived at the Haworth Parsonage from 1820 to 1861, which is now the Bronte Parsonage Museum.